Dr Abishek Iyer and Prof David Fairlie gave a presentation at the Experimental Biology (American Society for Pharmacology and Experimental Therapeutics) National Meeting in Orlando on liver fibrosis in a session on Inflammation and Tissue Injury. Dr Robert Reid and Prof David Fairlie gave an invited presentation at the American Chemical Society National Meeting (Organic Session on Heterocycles) in Orlando on heterocycles and GPCRs. Louise Friberg (Master's in Chemistry at University of Uppsala, Sweden) who will work with Dr Tim Hill on medicinal chemistry. Yu Zhe Peng (Master's in Biotechnology at UQ) who will work with Dr James Lim on cancer cell biology. Xun Li (Master's in Biotechnology at UQ) will work with Dr Ligong Liu on medicinal chemistry in immunology. Thank you to Ben Ahern for your efforts. Ben was an exchange student from Dickinson College, Carlisle, PA, USA (Bachelor's in Biochemistry and Molecular Biology) who completed a three-month lab practice training (Aug-Oct 2018) and two-month summer research program (Nov 2018 to Jan 2019) with Dr Ligong Liu on synthesis of drug metabolites with immunological activities. He has returned to the USA to continue his bachelor degree studies. The Fairlie Group was acknowledged by Clarivate Analytics (formerly ISI) with notification of "Global Highly Cited Researcher 2018" for Fairlie DP. Congratulations to all group members for their contributions to impactful research publications. Congratulations to Dr Ken Loh for winning an IMB Impact Award: Teamwork. Great reward for effort Ken! Thank you to senior researcher Dr Alpesh Malde who has been working diligently in the group for three months on protein-binding macrocycles. Alpesh is the founder of MaldE Scientific (www.MaldEScientific.com) which is investigating and validating structures and interactions of molecules with biopolymers using computational modelling. Welcome to new student Huy Nguyen, who joins us for 12 months as a visiting Masters Student from the University of Copenhagen, Denmark. The University of Queensland’s Associate Professor Antje Blumenthal, Professor Rob Capon and Professor David Fairlie have begun a three-year multidisciplinary collaboration to develop new antibiotics to treat tuberculosis. The project has been awarded $1.45 million by the US Department of Defense. Congratulations on your scholarships and good luck on your new adventures in science ! Congratulations to Dr Aline Dantas de Arujo on being awarded a $5,000 Industry Engagement Award to visit and present at companies in Boston! Congratulations to Dr Jeffrey Mak for winning a CASS Travel Award to present at the IUPAC International Conference for Organic Synthesis (Florence, Italy) where he presented a talk "Unstable metabolite from bacterial vitamin B2 biosyntheses potently activates T Cells. Dr Jeff Mak was awarded first place in the RSC Twitter Poster Conference competition, Chemical Biology section. Congratulations Jeff! Mr Yuanzhao Cao presented "Protease activated receptor 2 connects metabolism to inflammationin epithelial colonocytes"
posters at the Keystone Symposium on "GPCR Structure and Function: Taking GPCR Drug development and Discovery to the Next Level" Feb 16-20, 2018. Elorado Hotel and Spa in Santa Fe, New Mexico, USA. Congratulations to honours student Maddison McLaughlin who was awarded first class honours. Dr. Weijun Xu attends and presents a poster: “Computer modelling study of small molecule ligand binding site within the C3a Receptor” at a GPCR Workshop in Hawaii. Ms Jessica Rowley in the Fairlie Group has been notified that she has completed all requirements for the PhD degree of the University of Queensland. Congratulations Jess! Ms Geraldine Ler presented a talk at the Queensland Annual Chemistry Symposium: “Structure function relationships of a ribityluracil antigen on T-cell activation”. CoE Summit Presentations, Torquay, Victoria. Ms Kai-Chen Wu: 3-minute oral and poster presentation: “Intracellular trafficking of complement C5a receptor via Rab GTPases”. Justin Mitchell in the Fairlie Group has been notified that he has completed all requirements for the PhD degree of the University of Queensland. Congratulations Justin! Ms Geraldine Ler presented a poster at the UQ School of Biomedical Science International Postgraduate Symposium: “Dissecting contributions of ribitol hydroxyls to MAIT cell antigen presentation and activation”. Dr Aline Dantas de Arujo gave an oral presentation “Selenoethers As Surrogates Of Disulfide” at 6th Modern Solid Phase Peptide Synthesis & Its Applications, Fraser Island, Queensland, Australia. Prof. David Fairlie presents at the ACS Meeting in Washington DC, USA. Dr Jeff Mak gave two presentations at the RACI Centenary Congress in Melbourne. “Stabilising a reactive bacterial small molecule that activates T cells” and “T-cell antigen formed from distinct metabolic pathways”. Awarded a prize for Best Science Communication. Dr Tim Hill presented a talk Tuning GLP-1 and GLP-1 ligands into biased agonists of the GLP-1R through structural constraints and amino acid substitutions at the RACI Centenary Congress in Melbourne. The ARC Centre of Excellence in Advanced Molecular Imaging was revidewed today in Melbourne. 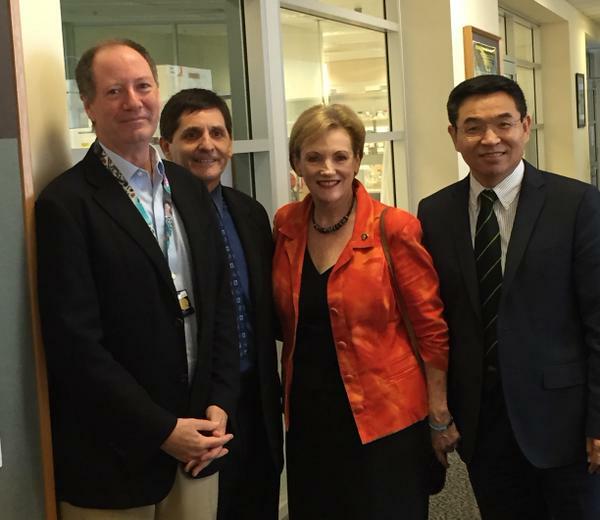 Dr Jeff Mak, Mr Weijun Xu and Prof David Fairlie were on interview panels. Dr. Tim Hill presents a poster “Tuning GLP-1 and GLP-1 ligands into biased agonists of the GLP-1R through structural constraints and amino acid substitutions”. at the 25th American Peptide Meeting, Whistler, Canada. Dr Aline Dantas de Arujo Award wining poster presentation “Supercharging Helical Peptides for Silencing Protein-Protein Interactions Through Covalent Irreversible Bonding” at 25th American Peptide Meeting, Whistler, Canada. Prof. David Fairlie is a plenary lecturer at the 100th Canadian Chemistry Conference, Toronto, Canada. We all know that green leafy vegetables, seafood, meat, dairy, cereals and even mushrooms, almonds and vegemite are all healthy for us. One essential ingredient in them is vitamin B2 (riboflavin) that enriches our immune system. But did you know that bacteria in our bodies also make this vitamin? Scientists at the Universities of Queensland, Melbourne and Monash recently learned that when bacteria produce this vitamin, they leave behind a trail of chemical footprints that are invisible under microscopes and vanish in minutes. Two chemists at the University of Queensland’s Institute for Molecular Bioscience, Dr Jeff Mak and Dr Ligong Liu, have now made these chemicals in a testube. Dr Mak said “Certain white blood cells in our immune system act like sniffer dogs in finding these footprints and chasing after bacteria to destroy them”. Dr Liu said “Our immune cells can find just a few molecules in a trillion (1,000,000,000,000) of these chemical footprints”. “By learning how to make these trace chemicals from bacteria, scientists around the world now have new tools to find even traces of infection in our body and new clues to fight disease”, added team leader Professor David Fairlie. The work published this week in Nature Communications was supported by the ARC Centre of Excellence in Advanced Molecular Imaging and the National Health and Medical Research Council of Australia. Weijun Xu in the Fairlie Group has been notified that he has completed all requirements for the PhD degree of the University of Queensland. Congratulations Weijun! PhD student Weijun Xu from The University of Queensland’s Institute for Molecular Bioscience used computer modelling to predict chemical structures, drugs and drug-like molecules that activate or inhibit T cells called MAIT cells. Such small compounds included salicylates, non-steroidal anti-inflammatory drugs like diclofenac, and drug metabolites. Researchers from University of Queensland, Monash University and University of Melbourne are a step closer to understanding immune sensitivities to well-known, and commonly prescribed, medications (Nature Immunology 2017, doi: 10.1038/ni.3679 [Epub ahead of print]). Congratulations to Dr Rink-Jan Lohman for winning an IMB Impact Award: Leadership and Mentorship. Well done Rink-Jan ! Congratulations to Ms Brianna Thompson and Mr Wai Shing Lim for receiving first class Honours degrees from University of Queensland for their research performance in 2016. Onwards and upwards Brianna and Wai Shing ! Congratulations to the Fairlie Group for $3.4M in funding (3 successful Project Grants and 1 Senior Principal Research Fellowship) in the current round of the Australian National Health and Medical Research Council. Congratulations to Dr Jacky Suen who was invited to speak at the IMB Centre for Inflammation Research and Disease symposium in Brisbane on 25 November, presenting on "Biased Modulation of Protease Activated Receptor 2". Congratulations Sam! Mr Samuel Perry in the Fairlie Group has been notified that he has completed all requirements for the PhD degree of the University of Queensland. IMB was successful in winning a $2.3M grant from the Australian Cancer Research Foundation for the new ACRF Cancer Ultrastructure and Function Facility (CUFF). Congratulations to Dr Ligong Liu and Dr Jacky Suen who were invited to speak at the ARC Centre of Excellence In Advanced Molecular Imaging annual symposium on 7-9 November in Torquay, Melbourne, Australia. Congratulations also to Ms Jess Rowley who won a poster award at the symposium. Short talk presenters (Dr Abishek Iyer, Dr Junxian Lim, Dr Jeff Mak, Ms Jess Rowley, Ms Yuhong Jiang, Ms Kai-Chen Wu, Mr Weijun Xu, Ms Geraldine Ler) also received great feedback on the high quality of their presentations. Mr Daniel Nielsen in the Fairlie Group has been notified that he has completed all requirements for the PhD degree of the University of Queensland. Congratulations Daniel ! Oral Presentation: "T cell activation by pyrimidine derivatives" David P. Fairlie, ORGN336, Division of Organic Chemistry. Welcome to new PhD student: Chongyang Wu. Helix Nucleation by the Smallest Known α-Helix in Water. Hoang HN et al, Angew Chem Int Ed Engl. 2016, 55, 8275-955. The intracellular pathway for the presentation of vitamin B-related antigens by the antigen-presenting molecule MR1. McWilliam HE et al, Nat Immunol. 2016, 17(5):531-7. Receptor residence time trumps drug-likeness and oral bioavailability in determining efficacy of complement C5a antagonists. Seow V et al, Sci Rep. 2016, 6:24575. Membrane-anchored Serine Protease Matriptase Is a Trigger of Pulmonary Fibrogenesis. Bardou O et al, Am J Respir Crit Care Med. 2016, 193(8):847-60. Potent Small Agonists of Protease Activated Receptor 2. Yau MK et al, ACS Med Chem Lett. 2016, 7(1):105-10. Differential Anti-inflammatory Activity of HDAC Inhibitors in Human Macrophages and Rat Arthritis. Lohman RJ, Iyer A et al, J Pharmacol Exp Ther. 2016, 356(2):387-96. Biased signalling and proteinase-activated receptors (PARs): targeting inflammatory disease. Br J Pharmacol 2014, 171, 1180-1194. T cell activation by transitory neo-antigens derived from distinct microbial pathways. Nature 2014, 509, 361-365. The Future of Peptide-based Drugs. Chem Biol Drug Design 2013, 81, 136-147. MR1 presents microbial vitamin B metabolites to MAIT cells. Nature 2012, 491, 717. Structure, function and pathophysiology of protease activated receptors. Pharmacol & Therapeutics 2011, 130, 248-282. Function, structure and therapeutic potential of complement C5a receptors. Br J Pharmacol 2007, 152, 429-448. Proteases universally recognize beta strands in their active sites. Chemical Reviews 2005, 105, 973-999. Ms Chai Yeen Goh from the Fairlie Group has been recognised by the award of a University Medal in her Bachelor of Biotechnology with First Class Honours at the University of Queensland. Congratulations Chai ! Mr Johan Hamidon in the Fairlie Group has been notified that he has completed all requirements for the PhD degree of the University of Queensland. Congratulations Johan ! Welcome to new PhD students: Peiqi Wang, Lilong Dong and Yuanzhao Cao. Ms Ahn Do in the Fairlie Group has been notified that she has completed all requirements for the PhD degree of the University of Queensland. Congratulations Anh ! Keystone Symposia on Molecular & Cellular Biology. G Protein-Coupled Receptors: Structure, Signaling and Drug Discovery. Keystone, Colorado, USA. "Receptor residence time determines oral efficacy of C5aR antagonists", Vernon Seow, Junxian Lim, Adam J. Cotterell, Mei-Kwan Yau, Weijun Xu, Rink-Jan Lohman, W. Mei Kok, Martin J. Stoermer, Matthew J. Sweet, Robert C. Reid, Jacky Y. Suen, David P. Fairlie. "Designing biased ligands for Protease Activated Receptor 2", Jacky Suen, Yuhong Jiang, Mei-Kwan Yau, Junxian Lim, Woan Mei, Kok, Weijun Xu, David Fairlie. Welcome to new Honours students: Wai Shing Lim and Brianna Thompson. Oral Presentation: "Cyclic Peptides and Oral Bioavailability: Challenging Convention", David P. Fairlie at Sanofi, Chilly-Mazarin, Paris, France. Congratulations to Dr Abishek Iyer who was invited to speak at the IMB Centre for Inflammation Research and Disease symposium, presenting on "PAR2 signalling reprograms cell metabolism leading to inflammation". Congratulations to Dr Jeff Mak and Dr Abishek Iyer who were invited to speak at the ARC Centre of Excellence In Advanced Molecular Imaging annual symposium at the Australian Synchrotron in Melbourne, Australia. Congratulations also to Ms Geraldine Ler who won a poster award at the symposium. Congratulations to PhD students Justin Mitchell and Daniel Neilsen, as well as Dr Jeff Mak and Dr Aline Dantes de Araujo for being invited to speak at the IMB Chemistry and Structural Biology Symposium in Brisbane. Congratulations to Dr Aline Dantes de Araujo who was an invited speaker at the ICCP conference on Moreton Island, Queensland. This project aims to discover how to create long-acting peptides for future research tools, drugs, biosensors and diagnostics. Peptides are currently viewed by the general community as injectable performance-enhancing drugs which are difficult to detect because they don’t last very long. However, peptides have many potential benefits that are difficult to obtain because of their short durations of action. This project aims to develop ways of engineering peptide shapes into nanoscale superglues that stick more tightly but selectively to their target proteins, thereby extending their durations of action. Technology for engineering superglues would produce proof of concept and prototypes for future research tools, drugs, diagnostics and biosensors. A drug development project that combines the expertise of Pfizer and the Institute for Molecular Bioscience researchers has been recognised at a University of Queensland awards ceremony. Professors David Craik and David Fairlie from IMB are partnering with Dr Daniel Grant from Pfizer Australia to produce a new class of drugs by engineering peptide drugs to be taken as a tablet rather than via injection. Dr Tim Hill and Dr Aline Dantes de Araujo from the Fairlie Group were key players leading this program. The University of Queensland has held its position among the world’s top 50 universities, ranking 46th globally and number one in Queensland in the 2015/16 QS World University Rankings. Congratulations to Dr Sheila Barbero (medicinal chemistry), Dr Shiao Chow (immunology/pharmacology) for each being awarded a Doctor of Philosophy degree from the University of Queensland. Also to Mr Lilong (Hugo) Dong and Miss Kai-Chen (Kathy) Wu for each being awarded a Masters degree from the University of Queensland. Congratulations to PhD student Daniel Nielsen on winning the Best Poster of the American Peptide Symposium in Orlando, Florida. PhD student in the Fairlie Group, Geraldine Ler, has been recognised for a third time for her outstanding results. Previously awarded the University Medal for coming top of class in her first and second year, she has also been awarded the University Medal for her honours year in 2014. Congratulations Geraldine ! Today we welcomed a visit by Mrs Jane Prentice MP, Federal Member of Parliament for the Quensland seat of Ryan. 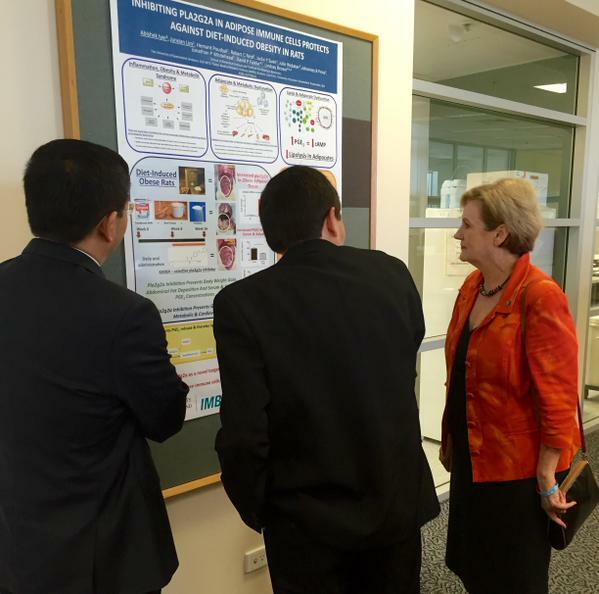 She was shown around IMB by Professor Max Lu (Provost of the University of Queensland) and Professor Brandon Wainright (Director of IMB). The Minister was introduced by Professor David Fairlie to the processes used in drug discovery research in our labs, culminating in discussions about our work at IMB and within the ARC Centre of Excellence in Advanced Molecular Imaging on obesity, inflammation and drug discovery. A highlight was the profile of a new anti-obesity drug from the Fairlie Group that has spectacular effects in diet-induced rodents.